How To Keep A Watch On Company News Without Wasting Too Much Time? How can an individual investor keep a watch on his or her companies important dates and updates without wasting too much time watching financial news channels? As an individual, if you have too many companies in your portfolio, it can become tough to remain updated about each news and event about the company and it can also become boring to follow all the news and events. There is no general rule as to how many stocks are too many and can vary from individual to individual but ideally, the number of stocks in an individual’s portfolio should be in between 5 and 20. If you have too few stocks i.e. less than 5, you have too little diversification but if you have more than 20, you are overly diversified. It may be a better choice to opt for the best mutual fund that invests in majorly in your stocks and you may not even need to invest in stocks directly. My personal choice is to keep the number of stocks in my portfolio to around 10 or 12 and go the focus investment route instead of being overly diversified. Note this is my personal preference and is not a rule, you are free to make your own rules and even break them if you know what you are doing. TV channels can take up a lot of your time for a small set of news that may interest you. So I don’t prefer to use them as a source of news for individual companies but can be used for a broader sectorial view. Personally, I don’t read newspapers but if I had to, it has tot be economic times for sure. 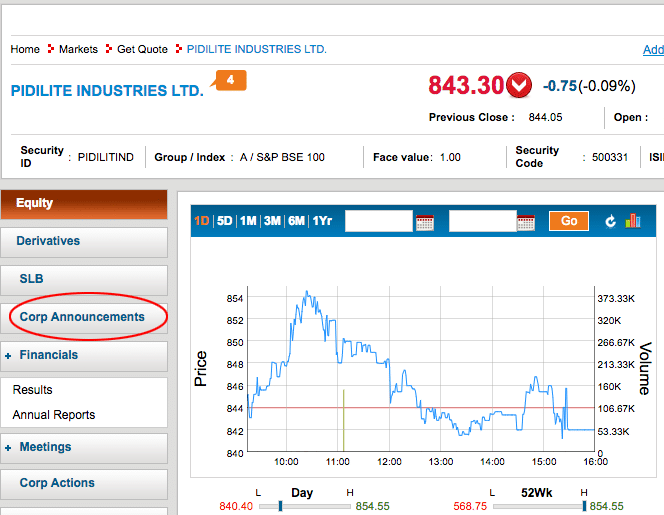 The tool I like for updates of the companies is from the exchange websites NSE and BSE. You can get all the information you need but at times it isn’t presented in a very easy to understand format still the information needed is there for us to use. NSE, the links is https://www.nseindia.com/corporates/corporateHome.html. If you don’t want to use the above link, you can visit the NSE website and search for a company in the top right-hand corner. Visit the company page and click on the company information tab where you can find all the information as a summary. The red+ will give you a small overview of the news and View all link in each section will take you to the details about each of those announcements. You can bookmark those View all links in your browser and keep track of announcements for each of your company in the portfolio. Note: The snapshot summary of shareholding patterns on NSE website is quite good to get the picture of the promoter holding in a company. The corporate updates are better organized on the BSE website than on NSE. Use the same process to find the company in the search box of the BSE website and then use the left navigation to click on the Corp Announcement to visit all the announcement a company has made in the reverse chronological order. 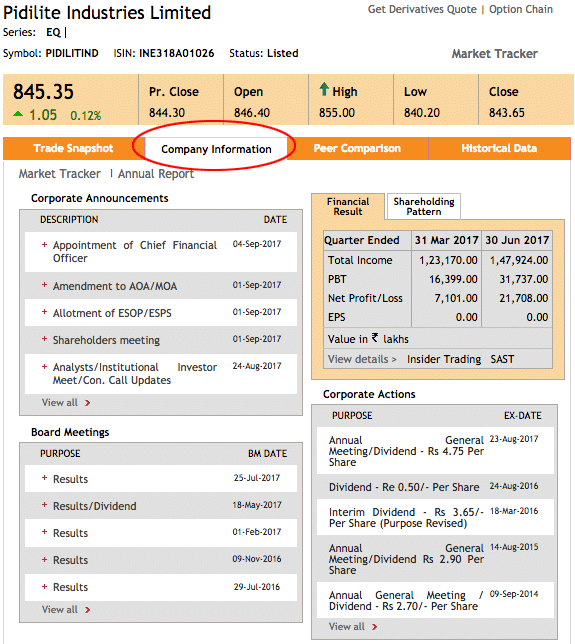 The link for corporate actions for Pidilite is http://www.bseindia.com/corporates/ann.aspx?scrip=500331&dur=A&expandable=0. So you can bookmark each of such links for each of the company you want to follow. 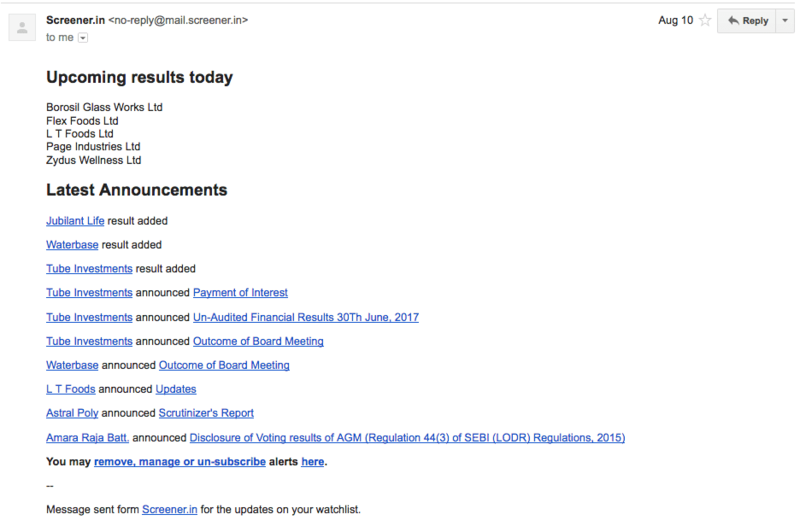 Possibly the best way to follow companies in your portfolio is through Screener.in‘s email alerts. Create an account at Screener.in and then add the companies to your watchlist. 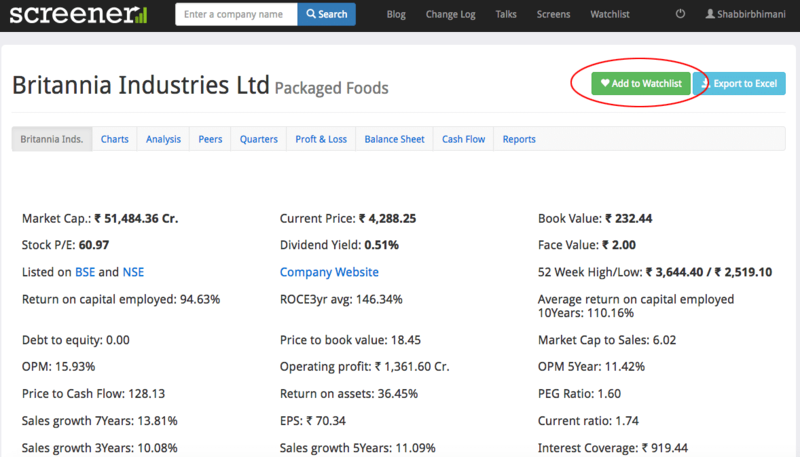 When logged in, you can add any stock to your watchlist with a click of a button and can customize the information you want to see on the front screen for a stock. Once you have a company in your watchlist, they email you daily about all the action happening on NSE and BSE websites for those companies along with the upcoming results. The email helps me keep updated on all the action happening for the companies in my watchlist. Screener email links directly the BSE website and so if you are using screener, you can stop following the official websites. The emails are short, sweet and to the point and so takes hardly a minute to go through them. If you aren’t using Screener.in, you may waste lot more time following the news and updates of your companies. You are here: Home / User Questions / How To Keep A Watch On Company News Without Wasting Too Much Time? 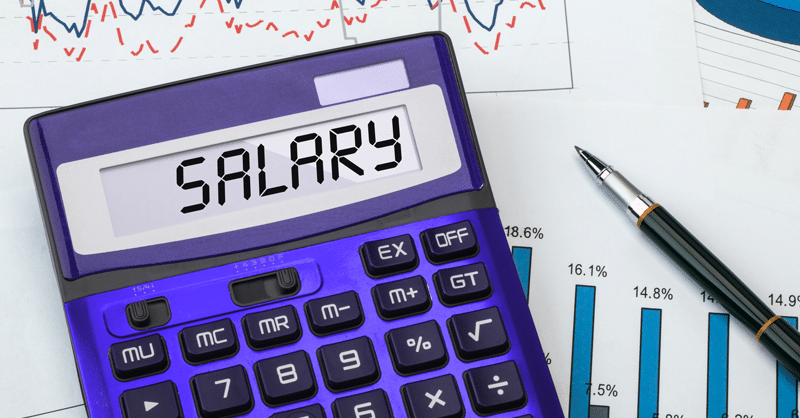 How And Where Indians Should Invest His or Her Salary?